The following was adapted from a talk about journalism and music presented to Leadership Music’s Media Day in Nashville on April 16, 2017. 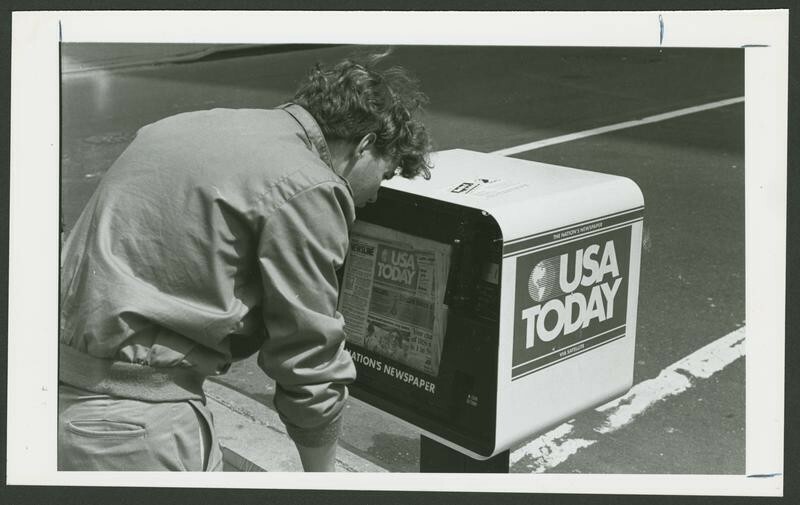 When newspapers tried to become television. We The People of the USA are having a national political conniption fit, including an ugly recent election, characterized by groups of people lamenting that they’ve had their livelihoods and indeed their way of life stolen from them by outside forces. Among the aggrieved: The manufacturing class. Family farmers. Coal Miners. And of course the coal miners of the human soul, songwriters. Everybody’s got a story of loss it seems — loss of income, stature, security, purpose, prestige. And during this multi-decade adjustment to technology and globalism, which is very real and inevitably not without disruption and pain, there has been a growing chorus of displeasure and then anger and now outright threat against what the people of our republic call “the media.” Every side of the political debate is furious about “the media,” declaring it biased against their values and dedicated to their demise in the political arena if not existentially. So I feel compelled to draw a distinction by pointing out that “the media” is a phantom concept, a meaningless term, as it’s widely used. Media (no air quotes) is a thing, encompassing all the modes and means of human communication. Moreover, media is one of the dominant forces shaping our culture, so more than ever media deserves study and understanding. We live in the most mediated age in human history — a gigantic experiment in information overload, surveillance, marketing and the human ego. There is no opt out and there is no control group. We need to know our own media more than ever yet we seem to know less than ever. And I say this because those who antagonize and accuse “the media” rarely if ever talk about a concept that’s much harder to gainsay and harder to smear, and that’s journalism. Media is a wide umbrella that includes journalism, but by no means does journalism equal “the media” or even “the press,” which ranges from honest reporting and commentary to explicitly partisan hackery. Journalism is a profession — one with history, standards, ethics and systems. It has checks and balances built in, with layers of supervision and scrutiny. Journalism is not opaque about its ways and means. Indeed, transparency is one of its virtues (though I will admit that anonymous sourcing has gotten out of hand). In general, however, journalism is self-reflective and self-policing, with a tradition of ombudsmen and trade associations and scholarship that investigates the work in real time. Given all that and the remarkable track record of journalism in exposing corruption and telling complex stories about life’s hidden forces, it is quite something to observe — over decades — how mocking and attacking “the media” has become a key platform plank for certain ideologies. It’s not even really about identifying ideological bias anymore; it’s just an applause line and a dopamine trigger. Meanwhile, those of us who chose journalism as a career because it was an honorable and exciting tradition dedicated to informing the world have found ourselves in a tough spot. We too have some legitimate grievances as far as the America that was versus the America that is today. Our job base has been decimated. Standards have been lowered for us and around us (less often but sometimes by us, shamefully). Those who have kept their jobs have been pressured to produce more “content” with less time and fewer resources for years. Morale is terrible. Freelance writing rates froze some time in the 1990s and never moved again. Despite all this, journalists tend to be publicly stoic people (less so among themselves, over drinks). We can take criticism; it goes with the character of the professionally curious. But blanket accusations of bad faith are as offensive to us as they would be to you, your field, your clan or your church. And now I’m sorry to say the ad hominem attacks against journalists are coming from the leader of the country that’s done the most in history to establish and uphold the legal and ethical space where journalism could support democracy. This is profoundly alarming and depressing. Journalists can take criticism. But blanket accusations of bad faith are as offensive to us as they would be to you, your field, your clan or your church. I wrote this preamble to my talk today in a rush as I wrestled with the mess of thoughts and facts I’d assembled on the subject of music journalism and print media. Because I realized that the organizing principle I was missing was my heart — my belief system. I have to convey to you my fervent hope that we will get serious again about facts and fiction, about hype versus insight, about foundational things that bind us together as people and as Americans. These are issues I’ve trafficked in for years as a student of media and culture, but they are much more than that. They are precepts that drive me. I believe the integrity and legitimacy of our press as surely as I believe in democracy and pluralism because they are parts of the same idea — one we are so lucky to live with, purportedly, as Americans. The title of this talk is “Print Is Print” which is not me being coy or some Zen concept that would take a lifetime to understand. It’s a simple prayer that print journalism no longer be asked to be everything other than what it is. Print is not video. Print is not imagery. Print is not a web site or an app. Every medium has integral strengths. And there is value in deftly mixing media. But so much of what’s gone haywire stems from the demands of publishers and business people that print become something that it’s not. Be more like a comic book. Be more like television. More like advertising, the internet, Twitter. As if any of this was going to turn the whole thing around. We haven’t let print be print for a long time, and it’s not produced good results. Written words, placed in thoughtful careful order and backed up by a commitment to honest communication is, without hyperbole, the most important invention in the history of humanity. The printed word enabled lawmaking, philosophy, contracts, literature and every invention and product we make use of today. Even scripture proclaims that “in the beginning was the word and the word was God.” And raised as I was by a law professor with his requisite belief in meaning and the primacy of the word, I can only see the last five decades of American culture, my life as it happens, as an age when hundreds of years of accumulated currency in the written word has been trivialized, denatured and debased. Hype. Spin. Marketing. PR. Verbiage. Advertorial. Copy. Code. Text. These are inevitable in a free market-based society and not inherently bad in most uses or settings. What’s bad is our alarming state of media illiteracy. We’re not good as a culture at sifting truth from hype. We don’t mind being lied to if we’re charmed by the liar. We don’t recoil enough when the integrity of the word is threatened. We and especially our younger people don’t know nearly enough about the multi-billion dollar industries honed over years to colonize our attention and divide us into demographic groups. We little understand the relentless campaign of manufactured desire and dependence directed at us across all media and now in the surveillance based online world. The only thing that will make us better, more whole, more grounded and reasonable in the long run is the shared truth that comes from a shared sense of words mattering. And we must do better at recognizing the difference between something spoken by a salesman or something spat out hastily in pixels on social media and actual journalism — reported information fixed credibly in print, mediated by authoritative people whose jobs matter and owe something to the public interest. You might say it ought to be written in stone.